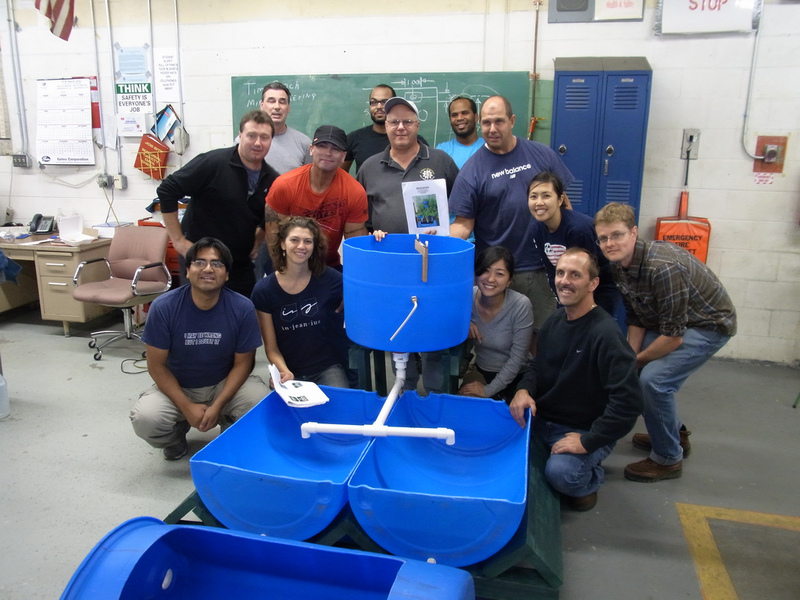 Members of the LCGD (Tony Dunn, Michael Graninger, Mark DeJoie, John Runyon, and others) and MIT CoLab (Carlos Espinoza-Toro, Elisha Goodman, Shoko Takemoto, and Kevin Feeney) pose in front of the aquaponics demonstration system. Aquaponics is a sustainable agricultural system that recycles nutrients and water in a soil-less environment. It combines two types of food production: aquaculture, which cultivates fish, and hydroponics, which grows plants without soil. Members of the LCGD installing the demonstration system. Since November 2009, CoLab Master’s student Elisha Goodman has worked with the Lynn Coalition for Green Development (LCGD) to pilot an aquaponics system in Lynn, Massachusetts. 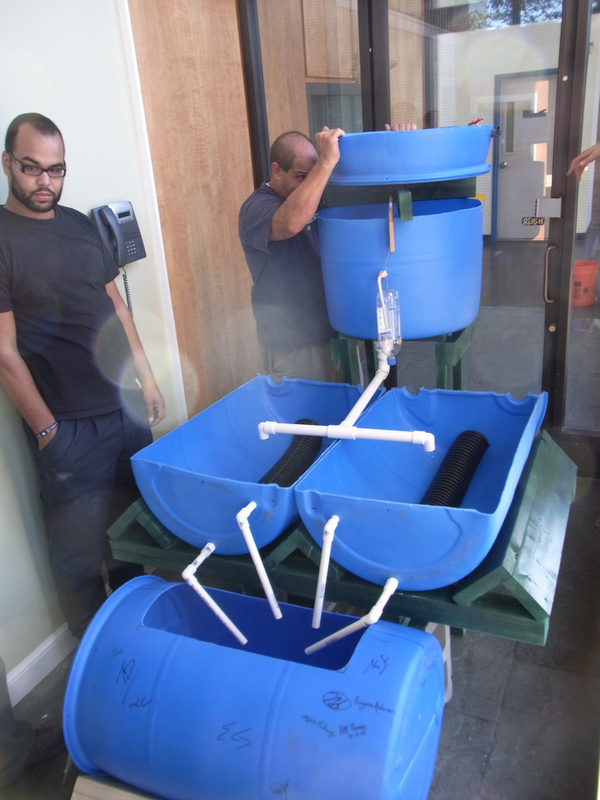 On October 2, 2010, Elisha and a team from MIT’s Department of Urban Studies and Planning worked with LCGD members to install the first aquaponics demonstration system in the SPIN Center (Serving People in Need, Inc.) on Union Street, the main street in downtown Lynn. The LCGD was founded in 2009 to stimulate community-controlled economic development through the creation of green jobs in Lynn. After over a year’s worth of coalition building, many organizations are now involved with the LCGD including the North Shore Labor Council, the Food Project in Lynn, the Highlands Coalition, Essex County Community Organization (ECCO), and Neighbor to Neighbor. The LCGD chose aquaponics as part of its economic development strategy because aquaponics is an indoor agricultural system that is suited for an urban environment like Lynn’s and could make use of the city’s vacant buildings. The project will also help create shared wealth generation by establishing cooperatively-owned businesses that create green jobs with family-sustaining wages and job security. The next posts in this series will explore in greater detail the history of Lynn and the creation of the LCGD, the mechanics of aquaponics, and the progress of the pilot aquaponics project. For more information about the demonstration system in the SPIN Center, visit the Facebook page here. Post by Chun Ying Wang. Chun Ying is a volunteer at CoLab. She has researched sustainable agriculture and community gardens. She recently graduated from Yale with a degree in Environmental Studies degree. She loves cooking and Arrested Development.